Lexington, Kentucky – P.S. Arianna, ridden by 21-year-old American eventer Madeline Backus, was named the Equis Boutique Best Presented Horse Award recipient during the 2017 Rolex Kentucky Three-Day Event CCI4*, presented by Land Rover, held April 26-30 in Lexington, KY.
Equis Boutique, a luxury tack and apparel shopping experience, sponsors the Best Presented Horse Award at various FEI-sanctioned events throughout the United States. The second Horse Inspection during Rolex Kentucky was held prior to the final show jumping phase on Sunday, April 30, at Kentucky Horse Park. Led by President Christina Klingspor of Sweden, the FEI Ground Jury evaluated the appearance and condition of the 40 horses that advanced to jog for show jumping competition and selected P.S. Arianna as the Equis Boutique Best Presented Horse Award winner. Cesar Hirsch (right), co-founder of Equis Boutique, presents Madeline Backus (left) with the Equis Boutique Best Presented Horse Award at the 2017 Rolex Kentucky Three-Day Event CCI4*, presented by Land Rover, in Lexington, KY.
Backus and her mother, Laura Backus of Pendragon Stud Equestrian Center in Larkspur, CO, developed P.S. Arianna, a 16-year-old bay Anglo-Trakehner mare (Ibsen x Amazing Prospect), with the ultimate goal always being Rolex Kentucky. Combined with their dressage and cross-country efforts, Backus and the horse she calls “Ari” rounded out the final top 20 in their first-ever appearance at the coveted event. While Backus often utilizes her time spent preparing P.S. Arianna for competition as an opportunity to focus, her friend Grace Simpson accompanied her to Rolex Kentucky to help groom. Backus, who hails from Larkspur, CO, has been a working student for Missy Ransehousen at Blue Hill Farm based in Unionville, PA, for the past two years and helped finance her first trip to Rolex Kentucky by selling baked goods at horse shows. 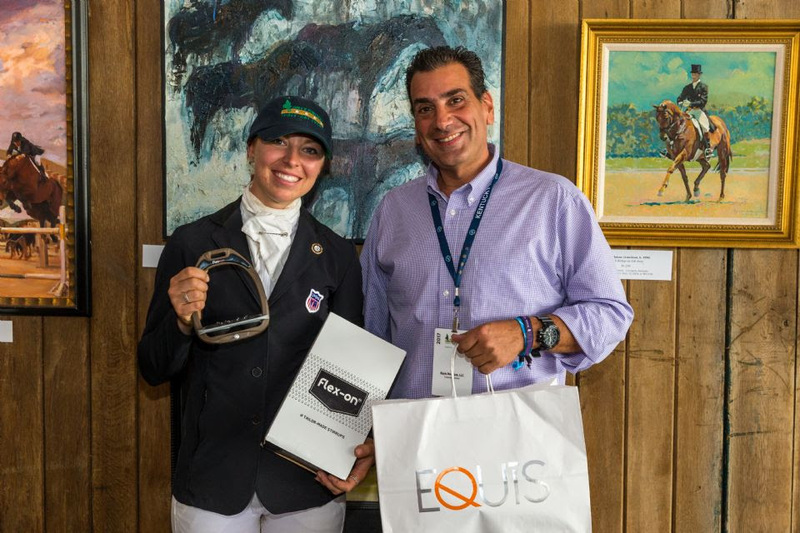 Backus was recognized for the Equis Best Presented Horse Award with a pair of custom stirrups from Equis Boutique partner brand Flex-On by Cesar Hirsch, co-founder of Equis Boutique. Equis Boutique is a shopping experience for the discerning equestrian and offers the most convenient and luxurious choice for top equine brands to dress both the horse and rider. Featured brands available at Equis Boutique include Dy’on, euro-star®, Flex-On, KASK, Kentucky Horsewear, Kingsland Equestrian, Manfredi Equestrian, Parlanti, and Theria Bits. For more information on Equis Boutique, please visit EquisBoutique.com, or look for Equis Boutique on Facebook and Instagram! Email [email protected] for questions on the stores and their products.